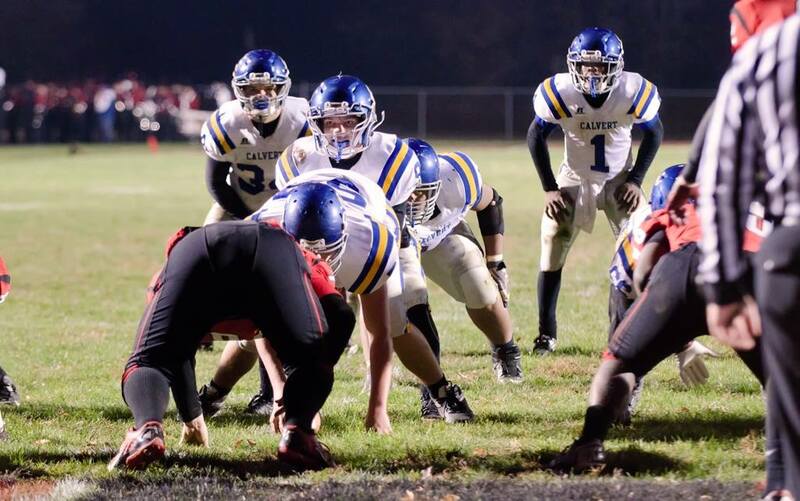 Calvert’s final contest against the Chopticon Braves featured some exciting and unexpected first time experiences. With over eight minutes left in the second quarter Chopticon was looking to extend their lead to six by completing a successful extra point try when the entire stadium went dark. The power to the stadium was lost and a near hour delay ensued. Both teams fought to keep their poise and focus until the lights finally brightened the cold football arena again. Once the delay was complete Chopticon scored their final point of the evening and then our Cavaliers proceeded to score thirteen unanswered points in the first half. The second half continued in the same fashion as our Cavaliers pounded the ball on offense for sixteen more points while the defense shut down the Braves offense completely. Then with only nine minutes left in the fourth quarter the power was lost to the stadium again and after a twenty minute delay Chopticon called the game and the Cavaliers end their 2013 season in the dark with a decisive 37-14 victory. The Cavaliers have shown time and time again that they have a never give up character with a deep and genuine love for one and the other. Although the season and our team are far from perfect, we are all grateful that the entire football program has made remarkable improvements over the course of this year. Each person involved has grown into some one better through the experiences of this year. Thank you to our players, coaches, families, school and community for the continued love and support.